Based purely on our latest data, no Week 3 matchup offers more intrigue than when the Dallas Cowboys (2-0) host the Atlanta Falcons (2-0). 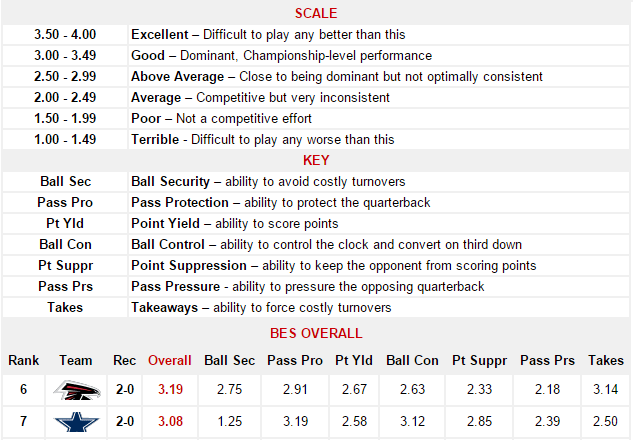 In terms of their BES Overall scores it appears the Falcons (3.19), have a slight edge over the Cowboys (3.08). However, closer inspection of the their categorical matchups reveals a larger and possibly game-deciding gap: The Falcons Takeaways score of 3.14 vs the Cowboys Ball Security score of 1.25. This is key because the Cowboys will be without injured starters quarterback Tony Romo (broken collarbone) and wide receiver Dez Bryant (broken foot), two critical cornerstones of their offense. In Romo’s stead will be backup Brandon Weeden who will potentially have to match scores with an explosive Falcons offense that averages 25 points per game and converts 48% of its third down attempts. The pressure to keep pace could lead Weeden to make some ill-advised throws. The Cowboys could alleviate Weeden of that pressure by establishing the running game but there exists problems there as well. Without the presence of Romo or Bryant, the Falcons defense can focus on stopping the Cowboys on the ground. Also, if the Cowboys fall too far behind, they may have to abandon the run entirely. Considering both teams offer good pass protection but lack a consistent pass rush, the game could be a high-scoring affair littered with big plays through the air. Overall, this game should be a very entertaining. But the BES scores and crippling injuries for the Cowboys suggests the Falcons will go 3-0 with their third consecutive defeat of an NFC East team to start the season.